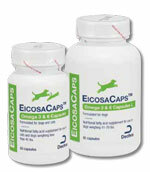 You are buying the Dechra Eicosa3FF SnipCaps For Dogs Weighing Over 30lbs 120ct, model #FFACL120. At ADW Diabetes, we offer a wide selection of Dechra products for cats and dogs. At ADW Diabetes, we can save you money on all of your pet grooming and health care products. The Dechra Eicosa3FF SnipCaps For Dogs Weighing Over 30lbs 120ct is used to aid the immune system and joint health for normal daily activity of animals. Eicosa3FF SnipCaps provide a concentrated source of beneficial Omega-3 Fatty Acids in a free fatty acid form, requiring less steps before absorption.